Old News is a 1½ hour video documentary suggesting western European Celts explored America's heartland by the Middle Ages, perhaps even before Christ. The theory of pre-Columbian, Old World visitors is controversial. Initially, most people are skeptical. So, here's a 3 minute video that provides some foundation for our theory. The postulation is not so crazy after all! Old News is a feature documentary in English shot on 16mm film, analog and digital video, written, produced and narrated by former Denver television news reporter Scott Monahan. It updates a preliminary report based on limited rock art treasures found in southeastern Colorado and the Oklahoma Panhandle introduced in Monahan's 1985 Denver PBS documentary "History on the Rocks". The new, revolutionary evidence for an ancient Celtic presence in America's heartland is persuasively assembled along with the old in a careful, methodical and dramatic fashion. Ancient Celtic Ogham writing, archaeoastronomical alignments, engraved constellation maps and anthropomorphic carvings tell a story that overwhelms traditional archaeologists and anthropologists. They refuse to seriously investigate the claims, wedded to their status quo mantra that European culture could not possibly have had contact with Native Americans any earlier than 522 years ago. The bright pathway of the Zodiac and our sun's predictable lap-markers in the sky are the genuine stars in our reality-centric story. Come and imagine how different life was before high technology! Then, see if you'll agree with our recognition that America's earliest, alphabetically written history must be rolled back by at least a millennium. An ancient alphabet known as Ogham represented sounds as sets of 1 to 5 notches on either side of a stem line or transecting it. Diphthongs, or vowel combinations, were generally more elaborate. This alphabetic key is based on the Ogham Tract in the 14th century Book of Ballymote which lists more than a hundred variations of the Celtic cipher. Examples survive on memorial stone pillars and elsewhere in Ireland. 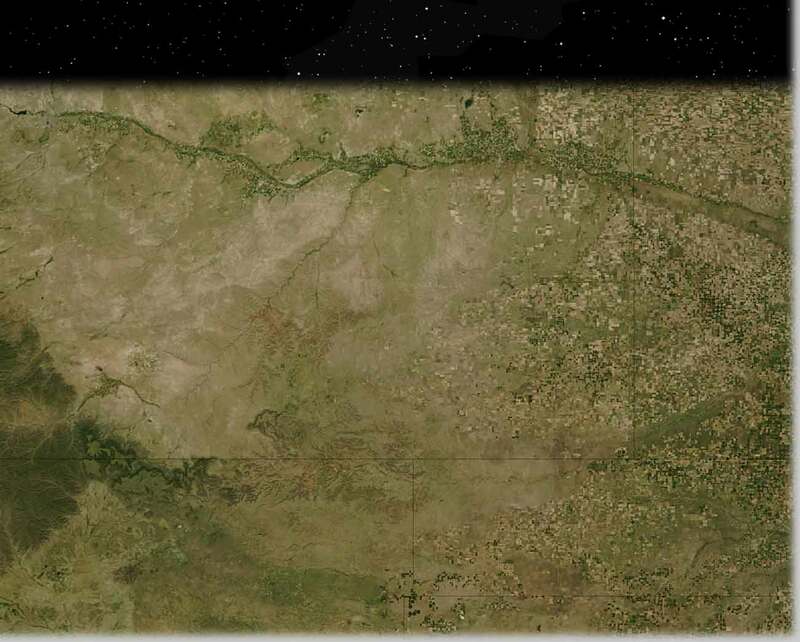 Very old grooves found on isolated sandstone surfaces in southeastern Colorado and the Oklahoma Panhandle can be translated from Common Celtic using the consonants and some diphthongs identified in the Book of Ballymote. However, no "tick mark" vowels are found in America, suggesting the writings were made prior to the time when single vowel sounds were added to the Ogham alphabet. 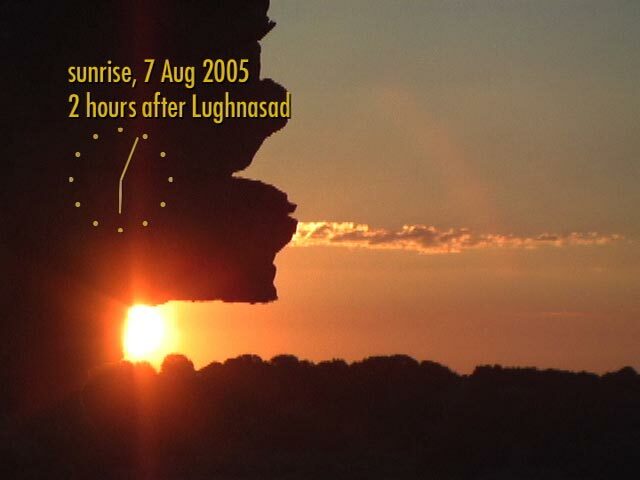 Lughnasad comes midway between the summer solstice and the fall equinox based on the sun's movement along the ecliptic. It is one of four annual cross quarters observed by ancient Celts to keep their calendars in step with the seasons. This sunrise was shot from a position in front of an inscribed circle on a cliff face 43 feet from a rock overhang or shelf. The archaeoastronomical alignment was predicted by one of the Ogham inscriptions at this southeastern Colorado site called the Sun Temple. Another Ogham inscription here translated as "Noble Twins" and includes a star map of three bold plus marks suggesting a triple planetary presence within a pattern of diminutive plus marks corresponding to the stars in the Gemini constellation, a phenomenon visible in the predawn eastern sky on 8 August 471 CE (Common Era, same as 471 A.D.). The distinctive, representative pattern for Gemini was commonly known to ancient Indo-Europeans who also referred by name to this constellation as the "Noble Twins". With only 4 minutes to go until direct sunshine fades, the head of the sun god Mithras mimics the concurrent appearance of the solar disc just touching the western mesa. The thumb pointer shadow protrusion will fit exactly into the carving of a dangling crescent moon at the moment of last light as the head of Mithras is fully obscured as the lower shadow climbs. 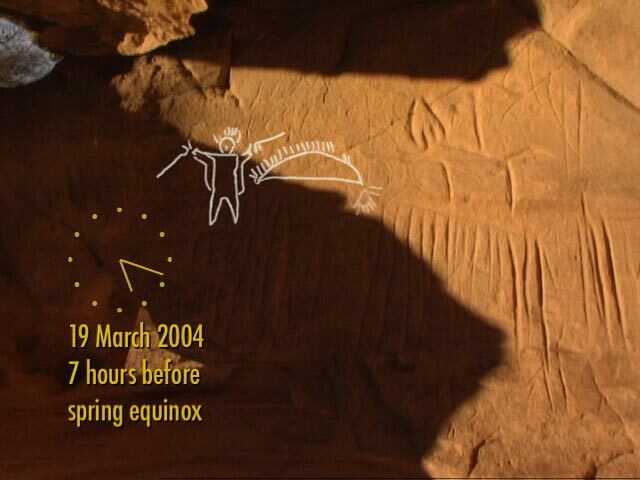 Two portals on the left connect this, the Anubis Cave, to the Nose Pointer Cave, where an hour earlier, another shadow play upon grooved writing marked the equinox, too. There, the Ogham inscription was translated to read, "the sun is six months in the pleasant north, in the gloomy south for the other months." Mithras worship is depicted in elaborate iconography involving a waxing and waning (or setting sun, highlighted here) and via the unique symbols of the initiate grades in this astral religion. Prominently shown is a canine figure with a flail, known as Mithras' partner Varuna or Anubis, jackal god of the night, or Heliodromus who propelled the sun on its daily journey. The other five grades in descending order are Perses, the Lion, the Soldier, the Bride and the Raven, each detailed in the documentary using artificial relief lighting at night. The artist appears to have also woven a star chart of important constellations into this panel and on another wall to the left in this cave.